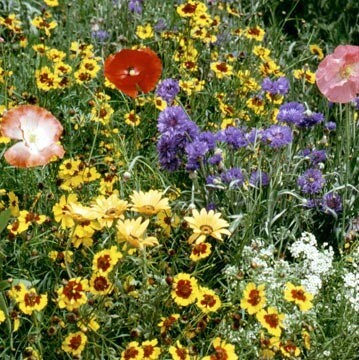 California Wildflower mix-Instead of having weeds cover your empty spaces why not cover it with Wildflowers. This is a blend of California's most beautiful wildflowers. And you don't have to live in California to grow them. That's the great thing about Wildflowers, you can grow them anywhere! Annuals in this blend re-seed and Perennials come back year after year. Comes with detailed growing instructions.